the Keitai Goddess : Honk! 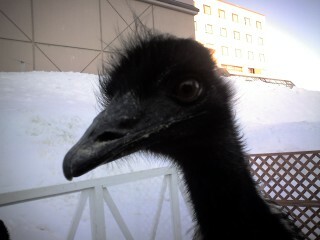 My fave animal - the emu. Previous entry: Petting the Penguin! I love emus. These guys were super cuddly. But perhaps they were just trying to stay warm. Felt it might be a bit cruel to have them in the snow as they really are desert animals. The llama was cuddly too. Then he gave my jacket a little nip. Was then afraid he was going to bit me on the face as he kept “kissing” my cheek.